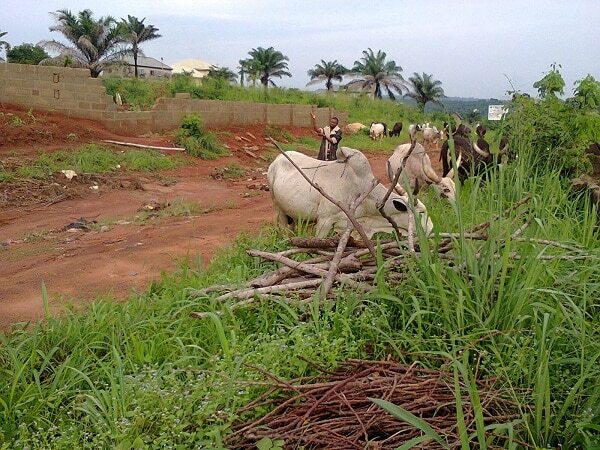 When it comes to ruminant farming, Nigeria still practice the archaic system of nomadic grazing and cut-and-carry system from bushes. 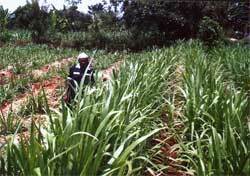 In countries like Kenya, livestock farmers grow grass to feed their animals. Many Nigerians may find this laughable but it is far better than what we’re used to. Growing your own grass means that you are sure that feed supply will be enough to meet your animals’ need. It is also hygienic. When I was young, we had some goats and I was the one that feed them. I normally went to bushes to cut grass. One thing that worried me so much is the eye-sores I normally encounter. I would always have to cope with the sight of human feces here and there. In fact, that was the main thing that discouraged me from goat farming. The Tumbukiza method, which originate from Kenya, has been known to improve grass yield (by about 2x) and drought tolerance. The grass will grow longer into the dry season before the leaves start dying off. 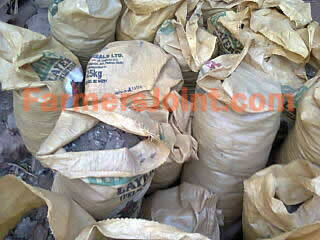 This means that feed will still be available during part of the dry season. But with irrigation, dry season will lose its significance. There are 2 types of Tumbukiza method: The round pit type and the rectangular pit type. Round Pit Type: Dig a pit 60cm in diameter and 60cm deep, leaving 60cm space between the pits. Rectangular Pit Type: Dig a pit 60cm deep and 60-90cm wide. The length of the pit will depend on the available land, but it should be as long as possible. Leave 90cm space between pits. Rectangular pits that are long make more economical use of land and are easier to irrigate. Poultry litter is a mixture of poultry manure, spilled feed, feathers, and bedding materials (such as wood shavings, sawdust, peanut hulls, shredded sugar cane, straw etc). Some will be shocked to discover that poultry litter can be fed to ruminants like cows, goats and sheep. Some will wonder how beneficial it is and its health implication to both ruminants and man. In a short while, we’ll be considering all these. Why Would Some People Feed Poultry Manure to their Animals? I’ll be writing about 3 reasons why farmers feed poultry litter to their animals. Do you want to discover more great info like these? Register for free and ask your question in our farming forum! Our knowledgeable members will have your questions answered. FarmersJoint.com strives to maintain accurate and up-to-date information; however, mistakes do happen and we won't be held accountable for anything that result from the use of information provided in this site. If you would like to correct or update any of the information, please send us an e-mail. THANK YOU!